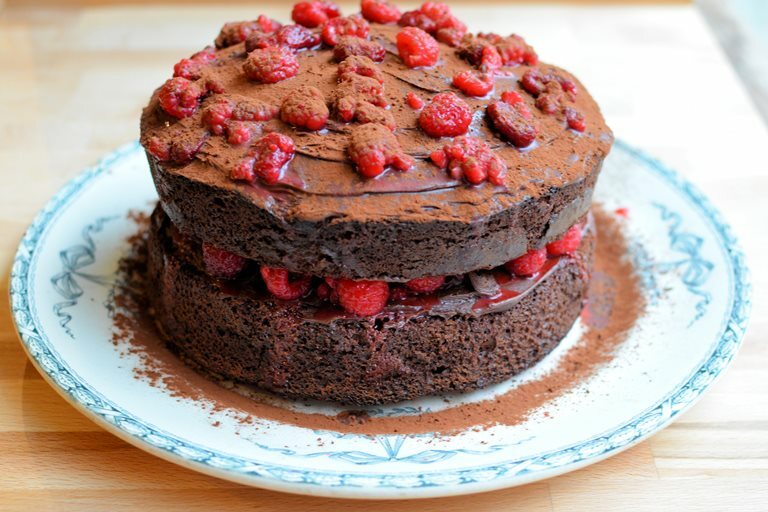 This decadent chocolate and raspberry cake is the perfect way to spoil your Mum on Mother's Day. Sandwich with rich chocolate buttercream or whipped cream, whichever is your mum's favourite. Mothering Sunday is almost upon us and I’ve been deciding what to make my mum this year! In the past I’ve dazzled her with Little Chocolate & Violet Fancies, Little Victoria Lemon Daisy Cakes and Strawberry and Yogurt Breakfast Muffins, but this year I want to make her a large and voluminous gateau instead of little cakes. I have lots of chocolate cake recipes, all of them tried and tested and in demand; and, I also have bags and bags of frozen raspberries from my garden, so a chocolate and raspberry cake seems to be the best idea – sandwiched together with rich chocolate buttercream (or cream) and topped with more buttercream and raspberries. I used my basic “drinking chocolate cake” recipe for the Mothering Sunday Chocolate Raspberry Gateau, and added a layer of raspberries in the middle of the cake too. There is something wonderful about adding raspberries to chocolate, it’s a marriage made in heaven and I often add raspberries (and berries) to chocolate brownies, including this sinfully decadent recipe for Double Chocolate and Summer Berries Truffle Slice. You have several options for this recipe – to sandwich the cake with rich chocolate buttercream, or to use whipped cream…..both work well, it simply depends on how rich you like your cakes. You can also use the raspberries from frozen, as they defrost the juices will drizzle over and into the cake, adding a fruity moistness, it’s almost like a chocolate raspberry drizzle cake! If you prefer, you can always whip 250ml of whipping cream until thick as a substitute to the buttercream.